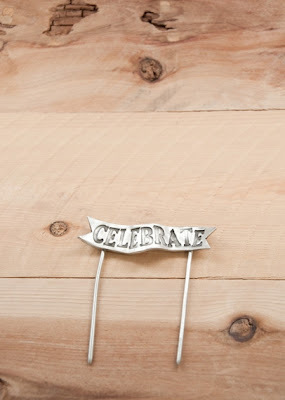 I'm so excited today because I'm hosting a giveaway from one of my very favorite online shops....Lisa Leonard Designs! I have loved Lisa's beautiful jewelry (and her lovely blog) for years. And I know that many of you feel the same way. Lisa recently sent me her beautiful dewdrops necklace, and I am completely smitten. 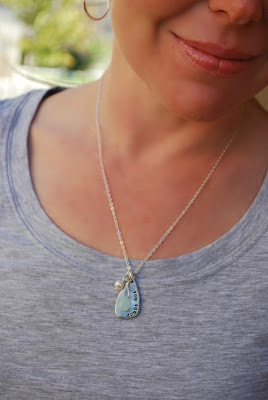 I love the organic look of the pendant, and the addition of the aquamarine drop and the freshwater pearl make it even more unique. If you know Lisa's jewelry at all, you'll already know that one of the great things about her products is that they can be customized. I chose to add two phrases to my pendant that are very meaningful to me....the front says "doubt not" and the back says "fear not". It's a wonderful way for me to have these always close to my heart! To enter please leave a comment on this post. This giveaway will be open until Wednesday, June 13 at 11:59 pm MST. The winner will be announced on this blog later in the week. This post is sponsored by Lisa Leonard Designs. I was given my necklace in exchange for this post, but the opinions expressed are 100% mine. She has so many nice things.. I don't even know what I would choose!! Thanks so much for the giveaway! Wow! what great designs, I love the idea of the banner and would love to win. Love the celebrate cake banner! I just love the owl designs. How could I not fall in love with the petite original necklace, after all...she used my name! What fun designs...Its hard to choose which I like the best! This is a great giveaway! Thank you. Love this necklace so cute and what a sweet sentimental piece to cherish for many many years to come. That necklace is just too cute. What a sweet sentimental piece to cherish for many ears to come. Love her jewelry. Beautiful. Would love to win. 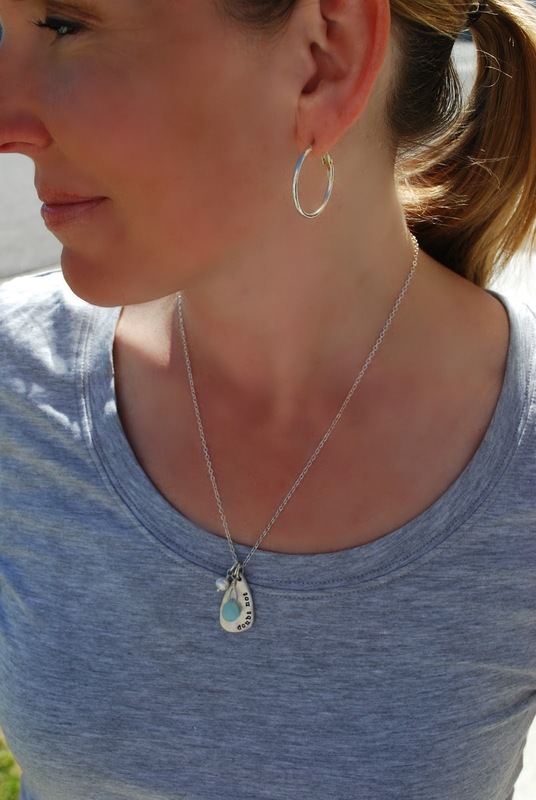 I love the dewdrop necklace...Gorgeous! I would love to win! I've always admired Lisa's designs. Thank you! This jewelry is fabulous! I love the necklace! I can always use a new necklace! I love Lisa's designs and her blog! I have loved Lisa's style for a while now too. Her products are gorgeous! Thanks for the chance to win. so cute!! Great giveaway - I'd love to win! I've always loved her work! I would love a chance to win! I'd love to win! I love the pennant! I too am smitten with her designs. Fingers crossed. I have always loved her designs. What a treat it would be to win something by Lisa! I love her designs! Thank You for the chance. i'd love to win, she makes the cutest stuff! Wow! This is indeed really nice. I really like the jewelries. I too am a lover of all things Lisa Leonard! Your new necklace is lovely! Thanks for the giveaway! Her necklaces are adorable! I would love to win! I have been drooling over her designs forever! I love ALL her stuff! Thanks for the giveaway!!! I love Lisa's designs! Thanks for the give away! Love the wedding items. Got a granddaughter getting married in November....perfect! Thank you for hosting this giveaway! I have given Lisa's jewelry as gifts and would love to indulge in something for myself! I would LOVE to win! I adore her designs! I would also Love, Love, Love to win. That banner is great! Love her line of products and your sayings are great that are personal to you. What a wonderful giveaway! Thanks for the chance to win!! I love the cake topper! Would go great atop my birthday cake this year to celebrate turning 30! I have one of Lisa's beautiful necklaces already with my two children's names on it. But in a few weeks we are adopting. I would love to have the same necklace but with all three names! 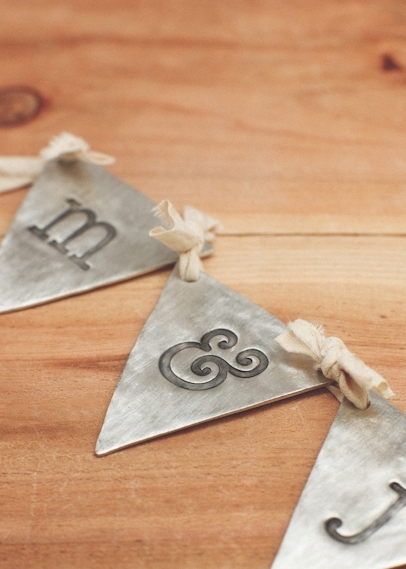 Everything on Lisa's website is beautiful but I especially love the pennant banner. My son recently got engaged and my soon to be daughter-in-law Megan would love it! Thanks for the chance to win. I love her jewelery - hope I am lucky!! 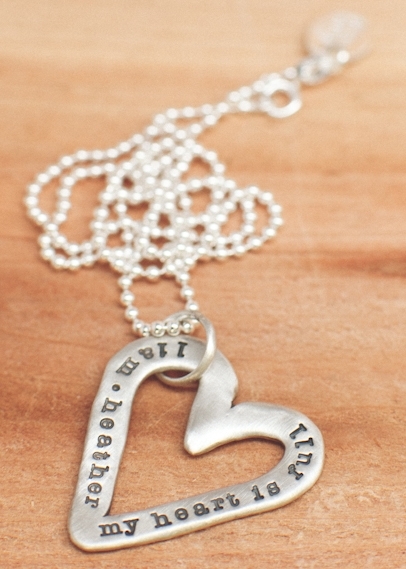 I've been looking for a great heart necklace like the one that says "my heart is full"- because mine is! Wow what beautiful stuff. I love it all. There are so many things I would LOVE to choose :) Thank you for the opportunity! I love her sense of style, as well as her jewelry designs! Would love to have one of these beautiful necklaces! Love her jewelry. My most treasured pieces are from her! Love all of her items! Would love to win! Beautiful designs! I would love to have somemade made by her..thanks for the chance! Lisa Leonard is one of my faves! I would LOVE to win, her items are so pretty! Thanks for the chance! Hope I win I will get the Heartstrings wall hanging. Thanks for the opportunity. Oh I LOVE these designs. I just retired from 30 years of teaching and this would be the perfect gift to ME! I LOVE Lisa's designs, that dewdrop necklace is SO nice! love the sweethearts tree necklace! Oh, I could have a lot of fun in Lisa's shop. Thanks for the giveaway! Would love to win this! Need something cheery! I've always wanted one of her designs! Beautiful pieces! I would love to win this! I love the silver leaf earrings! I absolutely adore Lisa Leonard! Her designs are all just stunning! I'm a huge fan of Lisa Leonard! Thanks so much! Can't wait to check out the new line. So pretty! I'm going to check out her blog, but I promise to come back! I love Lisa's designs. Crossing my fingers! Awesome giveaway. Thanks for offering the giveaway! My fingers are crossed that I would win something to celebrate my baby girl! Love Lisa Leonard's jewelry!!! Please, please, please let me win! Pretty please? I have been reading her blog for some time now and have always wanted a piece from her collection! Lisa's jewelry, toppers, and banner are grabbing at me. They are flat out adorable! Thanks for bringing her work to my attention. Oh I want one of everything. I LOVE these pieces of ART! Her designs are so beautiful! I would love to win! Oh, I would love to win! I have a friend who needs a necklace! Oh, I love everything she does! Beautiful. Thank you! Wow-awesome giveaway-thanks for offering it! Lisa has so many beautiful designs....sigh. Oh goodness, everything is so so lovely! Thank you kindly for the gorgeous giveaway! I love how the jewelry can be personalized. I'd love to win. What cute items she has! So different and unique designs. I'd love to win. i love lisa leonard and ALL that she designs! thanks for the chance to win! Oh, I love Lisa's blog and her jewelry! Thanks for teaming up for a great giveaway! I love the pearl by pearl earrings! They are so pretty. I love Lisa Leonard Designs. They have very pretty things that are high quality. I have a bracelet with my boys names on it. Love it! SO many great things! I love Lisa's designs and her blog! Thanks for the chance to win. Her jewelry looks really fun! Love her items! Always get compliments when I wear a necklace I got from her several years ago. Would love to have another necklace!! I love her jewelry! Thanks for introducing me to this! How fun! I could really use some new jewelry! I love Lisa's designs. I would love to win. I've entered her giveaways so many times and never won! I love your site Wendy. I love Lisa's designs, would love to win the gift certificate! Oh, how I would love to win! I love Lisa Leonard! Awesome! 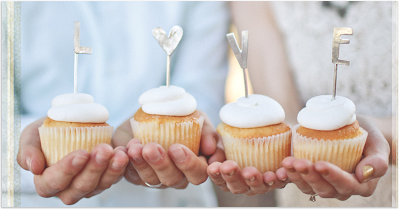 I love the cake toppers! I love Lisa's designs..it would be difficult to choose, but what a fun problem ! Thanks for the chance. I love the dewdrops necklace! But Lisa's shop is so full of fun stuff, it would be hard to choose!